A night in after a busy day of errands and rehearsal for Konnor. He practiced his little heart out in preparation of his music school's Fall Concert coming up next month. 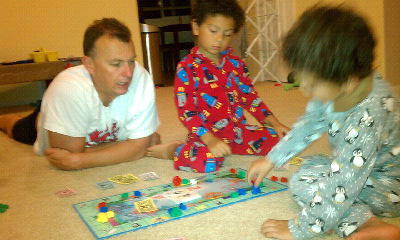 After dinner we ended the night playing Monopoly Junior. Our first time playing as a family. My oldest son, Konnor lead the way and became Mr. 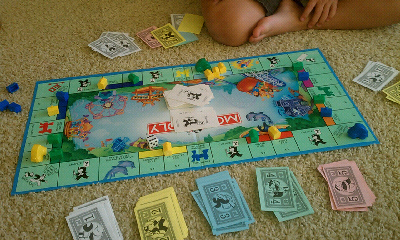 Monopoly himself until Daddy started collecting money. I was the one who loss my money first. 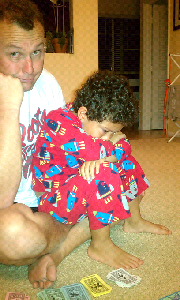 Shortly afterwards, Konnor started losing and became sad. He cringed, cried and pouted and I finally had to end the game and console him. I wasn't sure why he became so upset so quickly. After talking to him and consoling him, I found out the reason. He said, "I'm upset because I don't have a lot of money." After explaining to him that it was just a game, and that someone is going to win and someone is going to lose he didn't seem comforted. After a few minutes of crying and whining about losing most of his money, he came back to me and said, "I'm sorry I was crying but I was sad and I know it's just a game." Seems Daddy had a talk with him. Of course after that situation, it was game over and time for BED! That really explained his emotions. He was tired, from his busy day of no nap and losing his "play money" didn't settle too well.